Everybody go out and see the new animated movie, Everyone’s Hero, this weekend if you get the chance. It was the last movie that Christopher Reeve and his wife worked on before their untimely passings. 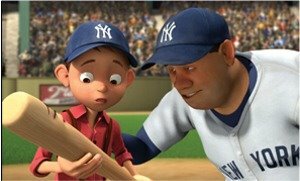 It follows the story of a boy whose father is the security guard for the Depression-era Yankees when Babe Ruth’s bat is stolen by one of the opposing teams players. 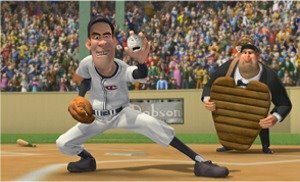 (You know it would be one of the Chicago Cubs). The boy’s father is blamed for it, so the kid sets out to get the bat back and repair his father’s rep, in time for Babe’s famous Called Shot. It looks to be a cool little movie…..
Take this list of the top 100 movies from the IMDB and bold the movies you have seen. This list is from May 2004. I pulled the meme off of The Daily Meme. Take the list and highlight the ones off of it that you have seen and pass it on to another blogger. As I am fairly new to the whole blogging thing, I don’t know many other bloggers to tag. So I will pass it on to two of the girl bloggers I know who read this blog occasionally, Kalinara & Ragnell, who can pass it on if they haven’t already done this meme before…..